Fiber Optic assemblies are built using the connector manufacturers’ termination procedures in conjunction with CompuLink termination and polishing procedures which allow for some operations to be automated. Automating certain operations such as polishing allow for more consistent quality of endface geometry of the connectors. Fiber Optic assemblies are 100% visually inspected before and after test. Multimode assemblies are 100% tested for Insertion Loss based on the connector manufacturers’ specifications. Multimode assemblies are in compliance with TIA/EIA-568 Singlemode assemblies are 100% tested for Insertion Loss and Return Loss and are in compliance with Telcordia GR-326. Interferometer testing for endface geometry is required on Ultra polish connectors. 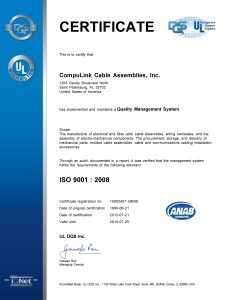 Various test set manufacturers are in use at CompuLink (i.e. Rifocs, Exfo). DORC and Norland Interferometers are used to inspect endface geometry. Visual inspection of the endface surface is performed before and after the physical contact testing using Westover 400x videoscopes to ensure no damage has been done during test. Transparent overlays which provide acceptance criteria based on industry standards are used during the visual inspections. Our cleaning methods meet or exceed section 4.0 of industry standard, IPC-8497-1. Our Fiber Optic assemblies are dry cleaned with lint-free wipes just prior to visually inspecting each connector using a 400X videoscope before and after test. If needed an additional wet clean with alcohol and lint-free wipe is used followed by a dry lint-free wipe. Connectors are cleaned before each mating. When the connector has passed all tests, the end cap is applied. End caps do not guarantee a clean connector. The connector end face can attract electrostatic dust particles from the air. In addition, some end caps are produced with materials which can lead to end face contamination. Fiber Optic manufacturers such as Corning Cable Systems, AT & T, Cisco Systems, and Commscope recommend starting with dry cleaning of the end face and continual inspection/cleaning each time the end cap is removed or the connector is unmated. Many of the manufacturers have cleaning flowcharts which can be found in the public domain. BICSI (Building Industry Consulting Service International) has addressed this in a presentation titled Fiber Optic Connector End Face Quality and Maintenance. Test data for multifiber (4 or more fibers) is recorded on test reports that ship with the assembly. For duplex and simplex assemblies, a bag label with the maximum acceptable Insertion Loss and Return Loss (if applicable) is applied to the individually bagged assembly. Actual test results may be requested for duplex and simplex assemblies at an additional cost. Additional sampling inspection based on ANSI/ASQC A1.4 at 1.5% AQL is performed by Quality Assurance on each lot. This consists of visual inspection of the endface surface using Westover 400x videoscopes, verification of length, label information/location, special requirements and documentation accuracy. Please be assured that the quality of our product is of the utmost importance. CompuLink’s concept of servicing our customers includes quality product arriving on time. Assemblies are coiled and individually bagged or spooled (determined by fiber count and length of assembly) to ensure a sufficient bend radius is maintained. Assemblies are layered (5 to 10 assemblies per layer) into bubble wrap lined cartons. Each layer is separated by bubble wrap. Paper filler is used to prevent shifting during shipment.